Have I mentioned yet how the volunteer work teams make all the difference down here? Here at Handsboro we make home for a constant cycle of volunteer work teams from all over the country. Some teams bring experienced construction workers and some crews come to do office or medical work. Some teams arrive with 40 members strong and some consist of just one or two dedicated people. They are from large California churches and small North Carolina congregations. They come in all ages, shapes, sizes, and attitudes. And each one of them brings a needed shot of faith, hope and love to this community- including myself. We're currently hosting a team of 30 from Newport Beach Presbyterian Church in Orange County, CA. It's a huge, wealthy church full of folks who are ready to fix things and do good all over the globe. They've been a bit frustrated this week because we've been slow to get the work done. You see, we've been thrown a kink in our work plans by mother nature. It's been raining! Since Sunday we've had nothing but rain, rain, rain. I haven't seen rain since I arrived on the Gulf Coast- I wasn't even sure it rained here at all. This week, I learned. It rains. It's been dumping. And that rain really slows our roofing, painting and building plans. Sometimes I think it might be funny to put a bunch Californians up on wet roofs and watch what happens, but down here they won't let me do it. I suppose that's Southern Hospitality for you. So, we had to scramble to find inside jobs for the Cali crew. We searched and searched our files, and finally found a great inside job just under our noses- the church sanctuary. Being over 100 years old the church has seen some shifting and her walls were covered in cracks and tears (you folks at DMPC haven't heard of anything like that, have you? He, he). They spent the day filling the cracks and preparing for new paint. This morning, when I joined them for their daily devotional mini-worship, one of their team members read Philippians 2: 3-7 and spoke about being a missionary as being a servant. He spoke about doing the work that needs to be done, regardless of your own agenda. He had been one of the team members who wanted to get out into the town and build roofs and houses and meet people and change lives and who had been frustrated by how the weather had changed his mission trip plans. But this morning he looked around the patched together sanctuary and noticed that, " if not for the rain, this work wouldn't have been done". That struck me. He was talking about this week's rain spurring all of the work on the church building, but I heard him preaching about the Katrina rains and how the work in this community wouldn't have been done with out them. All of the families, churches and schools that are rebuilding down here were hurting before the storm. The hope and joy coming out of this rebuilding effort is lifting this community higher than it stood before. I also heard him talking about me. 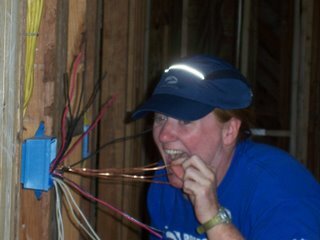 If not for the rain of tears that followed my sister's death, and my move back to Maryland, I may not have found my way down to Mississippi to join in the rebuilding effort to get my work done. I don' know that I would have had the emotional, physical, spiritual and financial resources to take on this challenge if not for the year and a half through with I struggled, explored and learned. And as much work as I do in this community, there is just as much work going on in my head, and my heart. That work would not have been done, if not for the rains. I know the teams come down here to serve and touch the lives of the Gulf Coast community- I just never expected to be included as a recipient of those gifts, to be included in that community so soon. Good Blog. I will miss the california team too, and all their delicious food. I wish you could have heard the pastor in New Mexico talking about water, basically that we're always baptized again when we come in contact with any water, because it is so transformative and powerful. Hurray for comments! Thanks B.
I totally agree about the water- I think that's why I was such a swimmer. You just feel new again every time you dip your head under. I love that.